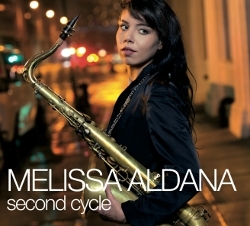 Chilean saxophonist Melissa Aldana’s latest album is Second Cycle (2012). In this interview, Aldana talks about being a third-generation saxophone player, following in the footsteps of her father and grandfather; how she arrived at the Berklee College of Music not speaking any English or knowing how to read music; why she’s always known what she wanted to do with her life; and how she met and befriended sax master George Coleman. Learn more at melissaaldana.com and follow her on Twitter at @MelissaAldana.